Komponist (1737-1806). "Aus der Schöpfung von Herrn J. Haydn." Autogr. musical manuscript. Arnsdorf. 5 SS. (4 Bll., zweifach gefalteter Bogen). Vier Stimmen mit unterlegtem Text. Qu.-Folio. 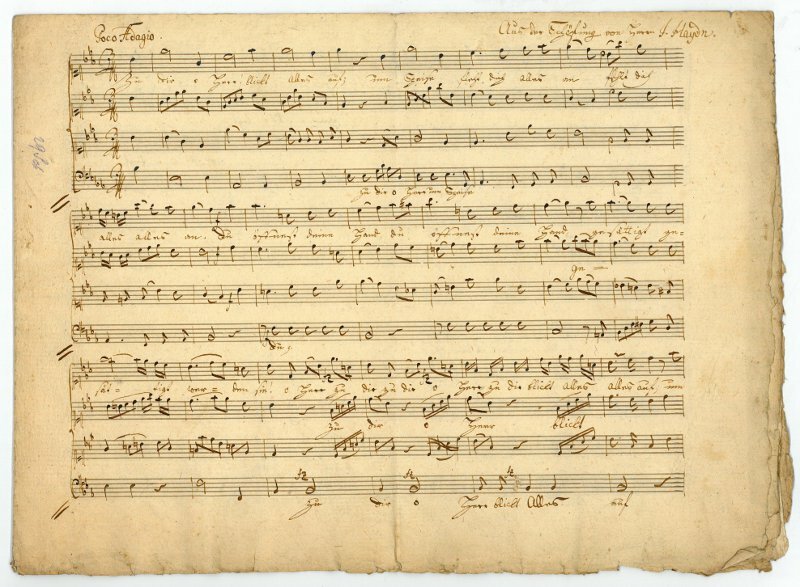 From part II of Joseph Haydn's oratorio: the trio "Zu dir, o Herr, blickt alles auf" ("Poco Adagio"), arranged by the composer's brother for his Arnsdorf male quartet. The caption as well as the postscript (with a statement of provenance) are added by the flautist and violist Georg Johann Schinn (1768-1833), a student and friend of Michael Haydn's: "Von Herrn M. Haydn für 4 Männerstimmen arrangirt zu Armsdorf am 6ten October 1800. 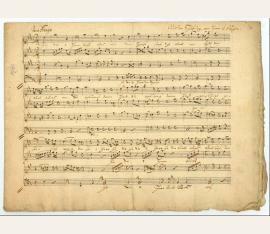 Vom Herrn P. Werigand Rettensteiner Pfarrer in Armsdorf die Original Partitur davon erhalten als Hochzeitgeschenk im 2. Dezbr. 1802". - From 1763 onwards, Joseph Haydn's younger brother served for 40 years as leader of the orchestra of Sigismund von Schrattenbach, the Salzburg Archbishop. The Arnsdorfer Benedictine monk Rettensteiner was a close friend who prepared German lyrics, copies, and adaptations for the male choir. For Michael Haydn he also translated numerous pieces of Latin liturgical music into German and collected material on Haydn's life and works. Much of this was used for the earliest biography of Michael Haydn, published by Schinn in 1808 (in collaboration with F. J. Otter). - Traces of an old vertical fold. Untrimmed, the final two leaves remaining uncut..